Scoot plans to pursue further rapid expansion over the next few years, resulting in significant market share gains in Singapore. The Singapore Airlines low cost subsidiary plans to grow its network to nearly 80 destinations by the end of 2020 and its fleet to 70 aircraft by the end of 2021. Scoot currently serves 65 destinations with a fleet of 45 aircraft. Scoot has a 14% share of seat capacity in Singapore and a 43% share of LCC capacity. Scoot is now more than twice the size of Singapore’s other local LCC, Jetstar Asia. Jetstar’s share of Singapore’s LCC market has shrunk from over 27% in 2010 – when it was as large as Scoot's predecessor Tigerair – to less than 20% currently. Its market share will shrink further and could dip below 15% as Jetstar Asia has no plans to resume expansion, whereas Scoot is poised to grow by another 50% over the next few years. Scoot’s share of the total Singapore market will likely exceed 20% by 2022 but Jetstar's share could shrink below 6%. Scoot is two years into an ambitious five-year expansion plan that includes a doubling of the fleet: from 35 aircraft in late 2016 to 70 aircraft at the end of 2021. Scoot is taking 14 737-800s from SilkAir over the next couple of years as SilkAir transfers 17 of its routes to Scoot. Scoot also plans to add capacity to some of its existing destinations and launch more new destinations. In addition to the 737s, Scoot is expanding its fleet with new A320neos and more 787s. The growth at Scoot comes as rival Jetstar and AirAsia have virtually stopped expanding in Singapore, resulting in big market share gains for Scoot. The evolution of the Singapore LCC market will be a topic of discussion at the CAPA Global LCC Summit in Singapore on 25/26-Feb-2019. For more details on the summit click here. Singapore’s LCC era began nearly 15 years ago, in 2004, with the launch of Jetstar Asia, Tiger Airways and Valuair. Jetstar Asia and Tiger were initially pure LCCs whereas Valuair followed a hybrid model. Valuair was taken over by Jetstar Asia in mid 2005 and operated as a separate entity under the Jetstar brand until late 2014, when Jetstar Asia stopped using the Valuair operator’s certificate. Jetstar Asia started pursuing a hybrid model several years ago and now relies heavily on network traffic, including connections with around 30 partner airlines. Tiger, which at first was partially owned by Singapore Airlines (SIA), was rebranded as Tigerair in 2013. The SIA Group took over Tigerair in early 2016, resulting in a delisting of Tiger Airways Holdings. Later, in Nov-2016, SIA announced a merger between Tigerair and Scoot, which the SIA Group had launched in 2012 as a fully owned long haul LCC subsidiary. The Tigerair-Scoot merger was completed in Jul-2017, resulting in a single LCC subsidiary under the Scoot brand but using the Tigerair operator’s certificate. Scoot started following a hybrid model after the merger and has increased its focus on transit traffic, including connections with its full service sister airlines SIA and SilkAir. AirAsia has also had a major presence in the Singapore market since 2008. AirAsia initially had a small presence in Singapore from 2005 to 2008, using only its Thai affiliate, and was able to pursue rapid expansion in 2008 and 2009 after bilateral restrictions were eased in the Singapore-Malaysia and Singapore-Indonesia markets. AirAsia is now the largest pure LCC in the Singapore market following the hybridization of Jetstar Asia and, more recently, Scoot. It does not have a Singapore operator’s certificate but has been able to compete effectively in the Singapore-Southeast Asia regional market using its airlines based in Malaysia, Indonesia, Thailand and the Philippines. AirAsia is the largest low cost brand in the Singapore-Southeast Asia market and accounts for 14% of seat capacity, compared to 13.5% for Scoot and 13% for Jetstar. However, Scoot is much larger overall as Southeast Asia only accounts for 39% of its total seat capacity. Jetstar Asia also serves other markets, but Southeast Asia accounts for nearly 80% of its seat capacity. In 2010, the AirAsia Group had as much total capacity in Singapore as the Jetstar Group and the Tigerair Group. LCCs accounted for 24% of total seat capacity in Singapore in 2010, with AirAsia, Jetstar, and Tigerair each capturing a 6.5% share. Jetstar Group’s share and the AirAsia Group’s share of total seat capacity in Singapore is now once again 6.5% (based on OAG schedules for the week commencing 25-Nov-2018). Meanwhile, Scoot now has more capacity in Singapore than Jetstar and AirAsia combined and accounts for a nearly 14% share of total seat capacity. Note: seat and capacity share figures are approximate. Jetstar and AirAsia have continued to grow in Singapore this decade in order to keep up with growth in the overall market. 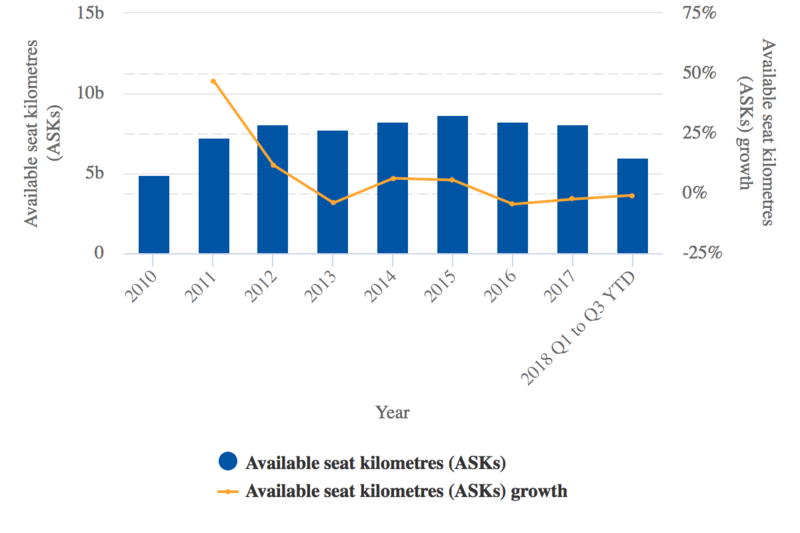 Total seat capacity in Singapore has increased by approximately 50% since 2010 and passenger traffic has increased at an even faster rate – from 42 million in 2010 to a projected 66 million in 2018. However, Tigerair/Scoot have grown much faster, driving almost all the growth in Singapore’s LCC penetration rate (from 24% in 2010 to 31% in 2018). 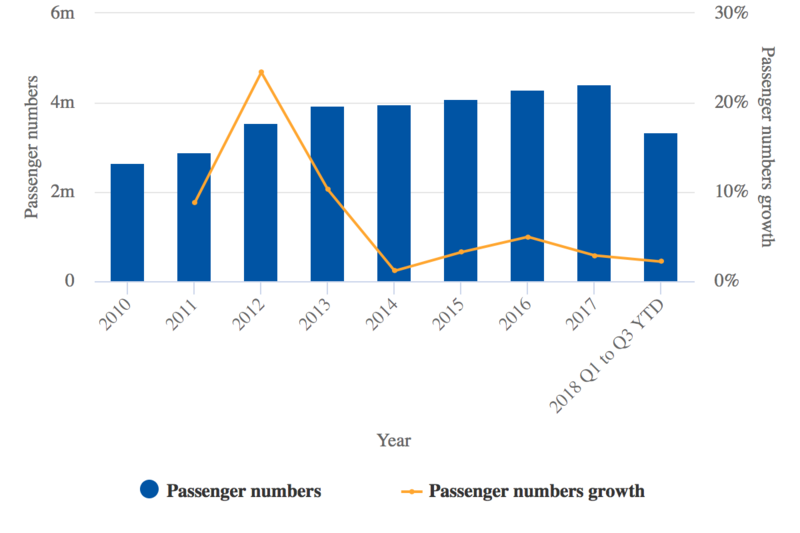 Total LCC capacity in Singapore has nearly doubled this decade: from less than 14 million annual seats in 2010 to around 26 million annual seats in 2018. Almost all the AirAsia and Jetstar growth in Singapore this decade occurred during the first half. In recent years, AirAsia and Jetstar have virtually stopped growing in Singapore. AirAsia’s capacity in Singapore peaked in late 2013 and early 2014, when it operated more than 300 departures from Singapore and accounted for an 8% share of total Singapore seat capacity. AirAsia subsequently reduced capacity in Singapore by around 15%, resulting in 260 weekly departures. AirAsia added back some capacity after moving to Singapore’s new Terminal 4 in late 2017 and this year has operated a Singapore schedule consisting of 280 weekly departures. AirAsia Group now carries slightly more than 5 million annual passengers to/from Singapore, but its Singapore traffic has dropped slightly since reaching a peak of 5.4 million passengers in 2014. Jetstar’s capacity in Singapore peaked in 2013 and has since been relatively flat. Jetstar Asia’s passenger traffic grew by nearly 50% from 2010 to 2013, but over the past five years has grown by only 15%. Source: CAPA – Centre for Aviation and company reports. Jetstar Asia flew 4.4 million passengers in 2017 and 3.3 million passengers in the first three quarters of CY2018. Virtually all of these passengers travelled to and from Singapore, since 94% of Jetstar Asia’s seat capacity is allocated to the Singapore market; the remaining 6% is allocated to three freedom routes (Clark, Manila and Taipei to Osaka). Jetstar Asia’s ASKs surged by more than 60% from 2010 to 2012 (includes Valuair). However, Jetstar Asia will fly fewer ASKs this year than in 2012. Jetstar Asia’s fleet has been stuck at 18 A320s since early 2014, when it reduced its fleet by one aircraft and suspended fleet expansion. Jetstar Group’s Singapore-based fleet peaked at 22 aircraft in 2013, made up of 19 A320s and three A330-200s that were operated by its Australia-based sister airline Jetstar Airways (but based in Singapore). Jetstar Airways currently operates only nine weekly flights to Singapore, consisting of two weekly A330-300 flights to Melbourne and seven weekly A320 flights to Bali. Jetstar Airways dropped widebody flights from Singapore to Beijing and Osaka in late 2013, and to Auckland in mid 2014. Melbourne (Jetstar’s only remaining long haul route from Singapore) was cut from daily to five weekly flights in 2013, to four weekly flights in 2017, and to only two weekly flights in Mar-2018. Jetstar Airways also previously operated A320s from Singapore to Darwin and Perth. Jetstar Asia still operates Singapore-Darwin but has also dropped Singapore-Perth. The Jetstar Group currently connects Singapore with 26 destinations. Jetstar Asia serves 25 destinations from Singapore; Jetstar Airways has one unique destination (Melbourne) and supplements Jetstar Asia on Bali. Jetstar Pacific also supplements Jetstar Asia on the Singapore-Ho Chi Minh route. Jetstar Asia has a total of 27 destinations when Singapore and Osaka are included; Osaka is not served nonstop from Singapore but as a one-stop using its three fifth freedom routes. Jetstar has 10 more nonstop destinations from Singapore than AirAsia but 35 fewer than Scoot (based on OAG schedules for the week commencing 26-Nov-2018). Of the 65 destinations excluding Singapore, 25 are served with 787 widebodies (legacy Scoot) and 43 with A320s (legacy Tigerair). Bangkok (both airports), Guangzhou, Taipei and Tokyo are currently served with a mix of A320s and 787s. Notes: Under the China column for narrowbody fleet, A320s are now currently operating to Guangzhou rather than Nanjing as indicated. A320s also currently used on some flights to Tokyo Narita via Taipei (not depicted above). Scoot recent announced plans to expand its Singapore network by 12 destinations by mid 2020, which will give it a total of 73 nonstop destinations from Singapore. 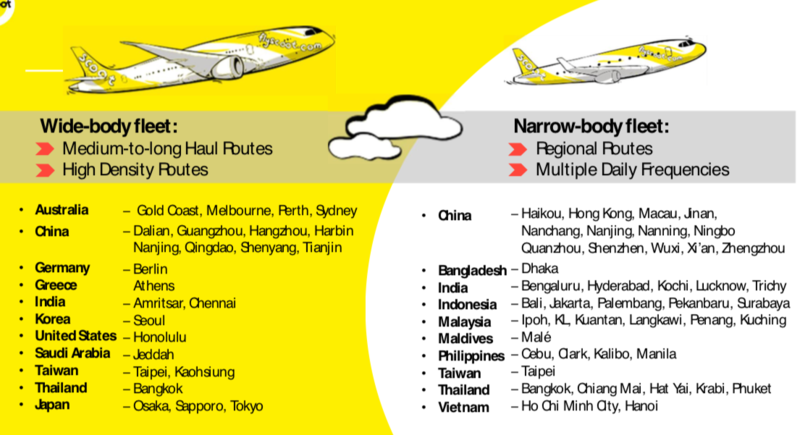 As a result, Scoot will have nearly three times as many Singapore routes as its rival Jetstar. Scoot is taking over 16 routes from SilkAir, which is also transferring 14 737-800s to Scoot. The routes being transferred include Luang Prabang and Vientiane in Laos (effective Apr-2019); Coimbatore, Trivandrum and Visakhapatnam in India (between May-2019 and Oct-2019); Changsha, Fuzhou, Kunming and Wuhan in China (between May-2019 and Jun-2019); Kota Kinabalu in Malaysia (Dec-2019) and Balikpapan, Lombok, Makassar, Mando, Semarang and Yogyakarta in Indonesia (between May-2020 and Jul-2020). SilkAir is also transferring its Chiang Mai flights to Scoot in Oct-2019 (for a total of 17 route transfers) but Scoot already serves Chiang Mai, so this is not a new destination. At the same time, Scoot is dropping four of its existing Singapore routes: Bengaluru (in May-2019), Shenzhen (in Jun-2019), Kochi (in Oct-2019) and Chennai (in Mahy-2019). These destinations are already served by SilkAir and/or Singapore Airlines and will only have a full service option from the SIA Group when Scoot withdraws. Scoot is also dropping Honolulu in late May-2019, but Honolulu is only served from Osaka (this route was only launched in late 2017). The 14 737-800s being transferred from Scoot will help support Scoot’s ambitious plan to double its fleet in the five-year period that began when the merger process with Tigerair began in late 2016. When Scoot and Tigerair began the merger process their combined fleet consisted of 35 aircraft: six 787-8s and six 787-9s under Scoot along with 21 A320s and two A319s under Tigerair. During the first few months of the merger process the fleet did not expand, but in the fiscal year beginning 1-Apr-2017 (FY2017/18) the fleet expanded by five aircraft. In the current fiscal year (FY2018/19) fleet expansion has accelerated, with four aircraft being added in the fiscal first half ending 30-Sep-2018 to a total of 44 aircraft: 24 A320ceos, 10 787-8s, eight 787-9s and two A319s. Scoot plans to expand its fleet by another four aircraft in 2HFY2018/2019 and end the current fiscal year (31-Mar-2019) with 48 aircraft: 26 A320ceos, two A320neos, 10 787-8s, eight 787-9s and two A319s. The first A320neo has already been put into service. Four A320ceos are being returned from IndiGo during fiscal second half and two A320ceos are being returned to lessors, for a net gain of two A320ceos. IndiGo subleased 12 A320s from Tigerair in 2014 and 2015 for terms of three to four years; the last of these aircraft are being returned to Scoot over the next few months. Notes: The three 787s in storage is a temporary situation due to a Rolls Royce engine issue. Scoot has been chartering SIA 777s to fill in for grounded 787s. The A320 being in storage is temporary as the aircraft is being prepared for return to a leasing company. Scoot plans to start operating its first 737-800, which will be retrofitted from 162-seat two class to 186-seat single class configuration, in the quarter commencing 1-Apr-2019. All 14 737-800s are expected to be transferred to Scoot by the end of 2021, at which point Scoot plans to have a total of 70 aircraft in its fleet. Scoot is also planning to add two 787-9s in 2019, two 787-8s in 2020 and two more 787s in 2021 (variant of 787 is not yet decided) for a total of 24 widebodies at the end of 2021. The additional 787s for 2021 have not yet been formally ordered but will be converted from 787-10s in the SIA order book. SIA recently converted two of its 49 787-10 orders to 787-8s for Scoot; these are the 787s slated for delivery 2020. The two 787s slated for delivery in 2019 are the last from SIA Group’s original order for 20 787s. Based on the 24 787s and the 14 737-800s, Scoot's A320 fleet will grow relatively modestly over the next three years and reach 32 aircraft at the end of 2021 (assuming the target of 70 total aircraft at the end of 2021 is achieved). Scoot has commitments for 39 A320neos, including the two being delivered in the current fiscal year. However, Scoot CEO Lee Lik Hsin says the rate of A320neo deliveries “in the early years are slow” and therefore only a handful will be received in the first three years. He explains that by the time Tigerair placed its A320neo order in 2015 most of the early delivery slots had already been sold. The last of the 39 A320neos is slated for delivery in 2025 and the delivery stream is back half heavy. This matches up with when most of Scoot’s A320ceos leases expire. Scoot's Airbus fleet will consist entirely of -neos by the end of 2025 as the last A320ceos lease expires in 2025. Scoot leases almost all of its narrowbody aircraft as these were inherited from Tigerair, which relied mainly on sale and leasebacks to fund aircraft acquisitions. Scoot’s 787s are owned, following the traditional SIA Group financing strategy. Scoot’s A320ceo leases generally expire when the aircraft reach 12 years old. All of Scoot’s current A320ceos (including the four aircraft that have not yet come back from IndiGo) were delivered from 2010 to 2013 and its two A319s were delivered in 2009. Scoot plans to return its two A319s, which it is eager to phase out, in 2021. Based on normal 12-year terms, Scoot would be returning all its remaining A320ceos between 2022 and 2025. However, a few years ago Tigerair forged sale leaseback deals on five of its A320ceos, with lease terms of only three to four years. Two of these aircraft have already been returned and three more will be returned over the next year. Therefore, Scoot is expected to return three A320ceos (including the two in 2HFY2018/19) and two A319ceos by the time it reaches the 70-aircraft mark at the end of 2021. This should give Scoot a fleet of 25 A320ceos at the end of 2021, along with seven A320neos, 24 787s and 14 737-800s. The rapid expansion of the fleet is driving high double digit capacity and passenger growth for Scoot. In addition to the doubling of the size of the fleet in just five years, the average size of Scoot’s narrowbody fleet is increasing as A320neos and 737-800s are delivered. The A320neos and 737-800s are both being configured with 186 seats, compared to 180 seats on the A320ceos and only 144 seats on the A319ceos. Scoot expects to grow capacity by 15% to 20% per annum over the next few years. Scoot recorded ASK growth of 16% in 1HFY2018/19 and is now projecting 16% growth for the full year. Similar ASK growth is expected in FY2019/20, FY2020/21 and FY2020/21 as the fleet expands to 70 aircraft. Scoot’s passenger numbers increased 11% to 9.5 million in FY2017/18 and were up another 14% in 1HFY2018/19. The airline is on pace to carry nearly 11 million passengers in the current fiscal year, compared to 7.5 million in FY2016/17. Assuming 15% growth per annum over the next few years, Scoot’s passenger numbers should reach almost 17 million FY2021/2022. This would represent growth of close to 120% compared to FY2016 and would be in line with the doubling of the fleet over the same five-year period. Assuming that Scoot continues to maintain the same amount of capacity on fifth freedom routes and continued 6% overall growth per annum for Singapore Changi, Scoot’s market share in Singapore should increase from approximately 11% in FY2016/17 to 21% in FY2021/22. Scoot and Jetstar Asia strategies have converged in some respects, when it comes to offering a hybrid product and pursuing transit traffic. However, their strategies have diverged, with Jetstar Asia focusing on profitability rather than growth, whereas Scoot is accelerating expansion as part of an SIA Group drive to resume growth in its home market. Jetstar Asia CEO Bara Pasupathi told CAPA TV at the 9-Nov-2018 CAPA Asia Aviation Summit that the airline had no plans at the moment to resume fleet expansion or upgauge any of its existing A320ceos to A321neos, which the Jetstar Group has ordered. “We will do the necessary steps to accommodate the level of growth the market requires but for now in Singapore we are happy with the way the aircraft are performing and how we are servicing those markets with the aircraft”, Mr Pasupathi said. He added that Jetstar Asia is “very disciplined”, and “we are happy that performing in the kind of niche model we have and the way we are cooperating with our partners and the way we are selectively growing our business”. Jetstar Asia has added capacity in some existing markets this year while reducing capacity in other markets. It has not launched any new destinations this year but launched three in late 2017. Although Scoot has a much larger (and much faster growing) network than Jetstar Asia, Jetstar Asia has nine destinations that are not served by Scoot – Darwin, Jieyang, Medan, Okinawa, Phnom Penh, Sanya, Siem Reap, Yangon and Da Nang. On all nine of these routes Jetstar is the only LCC. The fact that SilkAir serves six of these destinations and none were among the 17 recently announced route transfers from SilkAir to Scoot is a testament to Jetstar Asia’s success in the Singapore market. While it is not planning to expand capacity overall, Jetstar Asia continues to look for potential new underserved or unserved markets. “We are very focused in terms of staying in markets where we perform and finding new original markets where we get a good return for our shareholders”, Mr Pasupathi says. However, Jetstar Asia is not the only LCC evaluating potential new routes from Singapore. While Scoot is focusing most of its upcoming capacity expansion on route transfers from SilkAir and additional frequencies on existing routes, it is also keen to launch new destinations. The short and medium haul market within Asia Pacific is particularly saturated, accounting for 80 of the current 84 LCC routes from Singapore. One of the four exceptions, London Gatwick, is being dropped in Feb-2019 when Norwegian pulls out of the Singapore market. Scoot serves the other three – Athens, Berlin and Jeddah. However, Scoot is not likely to add a new long haul destination in the near term. While its overall capacity grows another 50% over the next three years it is focused almost entirely on further expansion within Asia Pacific. Scoot’s new strategy is focused on supporting the overall SIA Group by reducing its costs on short haul routes where there is now limited premium demand. In deciding on route transfers, the group has also tried to select routes that have significant traffic, but not a majority of traffic, connecting beyond Singapore. Scoot is generally a more suitable brand than SilkAir or SIA for local point-to-point traffic, while also providing some feed to SIA’s long haul network. Adding a third aircraft type is hardly ideal, but Scoot believes the 737s will not significantly impact its cost base as it is able to leverage existing contracts at the group level in supporting the 737s. Scoot’s costs have been inching up as it has hybridised but it still has a huge cost advantage over SilkAir or SIA, making it the SIA Group’s preferred platform to grow in a highly competitive market. Scoot’s rapid expansion over the next few years will likely impact its profitability. Scoot was back in the red in the most recent quarter (ending 30-Sep-2018), with a small operating loss after 11 consecutive profitable quarters. However, the current expansion phase is important from a strategic perspective. Scoot is rapidly gaining market share in Singapore, improving the SIA Group’s long term position in its home market ahead of the opening of a third runway and fifth terminal. The Jetstar Group and parent Qantas understandably have a different approach from that of Singapore-based SIA.